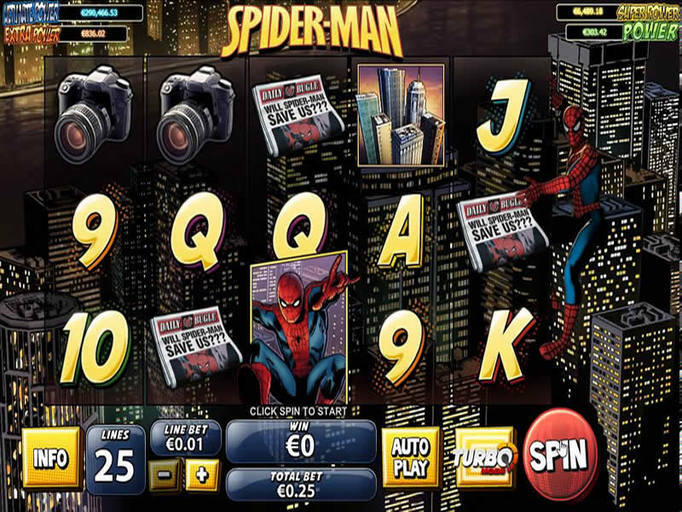 Marvel-themed games are all the rage these days and Playtech has captured that popularity in the Spiderman slot machine. This is a five-reel, 25-payline option that features not only a handsome $25,000 in-game jackpot, but an ever-climbing progressive jackpot, as well. The theme of this title sticks to the comic book rather than the movies, and you'll see a city background as well as all of the popular symbols you'd expect on the reels. Using the buttons at the bottom of the screen or the settings in the Autoplay feature, you can set up your per-spin bet amount in coin denominations ranging from a penny to $5. Since you can wager up to one coin per line on the 25 lines, this means that bets range from a penny to $125, making it a good choice for both small spenders and those who like a bit more risk. Of course, the top jackpot can only be won with a maximum bet. The bonus round is triggered when three or more of Spiderman himself appear from left to right. You can choose exactly how this is going to play out, too, and this is something that not many software providers offer. First, you can choose to grab yourself 15 free spins with no multiplier. Though this is a bit of a bummer for some people, remember that you aren't going to pay for those spins. However, you can also choose the Venom bonus in which you'll need to chase the villain in order to save Mary Jane. You can stop bad guys along the way and earn instant cash prizes, too. Of course, if you choose the wrong path, your nemesis will escape and the bonus round will be over. Though this title is a bit different in the ways in which things tend to play out, it's still a lot of fun for anyone who is looking for something different. You can check it out today at Sports Interaction Casino where you'll get some Spiderman free spins to give it a shot without any risk or investment. Then, if you decide to continue to play once these have expired, you can grab a nice 100% deposit match of up to $100 to help you boost your bankroll, meet your wagering requirements, and ultimately cash out anything you've won.